Datera recently presented at Storage Field Day 18. You can see videos of their presentation here, and download my rough notes from here. Combine both of these and you get Datera. L3 Networking – Datera brings standard protocols with modern networking to data centre storage. Resources are designed to float to allow for agility, availability, and scalability. Policy-based Operations – Datera was built from day 1 with policy controls and policy templates to easy operations at scale while maintaining agility and availability. I’ve waxed lyrical about Datera’s intent-based approach previously. I like the idea that they’re positioning themselves as “Enterprise SDS”. While my day job is now at a service provider, I spent a lot of time in enterprise shops getting crusty applications to keep on running, as best as they could, on equally crusty storage arrays. Something like Datera comes along with a cool hybrid storage approach and the enterprise guys get a little nervous. They want replication, they want resiliency, they want to apply QoS policies to it. The software-defined data centre is the darling architecture of the private cloud world. Everyone wants to work with infrastructure that can be easily automated, highly available, and extremely scalable. Historically, some of these features have flown in the face of what the enterprise wants: stability, performance, resiliency. The enterprise guys aren’t super keen on updating platforms in the middle of the day. They want to buy multiples of infrastructure components. And they want multiple sets of infrastructure protecting applications. They aren’t that far away from those software-defined folks in any case. The ability to combine continuous optimisation with high availability is a neat part of Datera’s value proposition. Like a number of software-defined storage solutions, the ability to rapidly iterate new features within the platform, while maintaining that “enterprise” feel in terms of stability and resiliency, is a pretty cool thing. Datera are working hard to bring the best of both worlds together, and managing to deliver the agility that enterprise wants, while maintaining the availability within the infrastructure that they crave. I’ve spoken at length before about the brutally slow pace of working in some enterprise storage shops. Operations staff are constantly being handed steamers from under-resourced or inexperienced project delivery staff. Change management people are crippling the pace. And the CIO wants to know why you’ve not moved your SQL 2005 environment to AWS. There are some very good reasons why things work the way they do (and also some very bad ones), and innovation can be painfully hard to make happen in these environments. The private cloud kids, on the other hand, are all in on the fast paced, fail fast, software-defined life. They’ve theoretically got it all humming along without a whole lot of involvement on a daily basis. Sure, they’re living on the edge (do I sound old and curmudgeonly yet?). In my opinion, Datera are doing a pretty decent job of bringing these two worlds together. I’m looking forward to seeing what they do in the next 12 months to progress that endeavour. Disclaimer: I recently attended Storage Field Day 12. My flights, accommodation and other expenses were paid for by Tech Field Day. There is no requirement for me to blog about any of the content presented and I am not compensated in any way for my time at the event. Some materials presented were discussed under NDA and don’t form part of my blog posts, but could influence future discussions. Here are some notes from Datera‘s presentation at Storage Field Day 12. You can view the video here and download my rough notes here. Datera’s Mark Fleischmann spent some time talking to us about the direction Datera think the industry is heading. They’re seeing the adoption of public cloud operations and architecture as the “new IT blueprint”. Ultimately, a move to a “Unified Hybrid Cloud” seems to be the desired end-state for most enterprises, where we’re able to leverage a bunch of different solutions depending on requirements, etc. In my mind it’s not that dissimilar to the focus on “best of breed” that was popular when I first got into the technology industry. It’s a concept that looks great on a slide, but it’s a lot harder to effect than people realise. For Datera, the key attribute is the policy based one. I wrote a little about the focus on intent after I saw them at Storage Field Day 10. I still think this is a key part of Datera’s value proposition, but they’ve branched out a bit more and are now also focused particularly on high performance and low latency. Datera are indeed keen to “give people better than public cloud”, and are working on hybrid cloud data management to provide a fabric across public and private clouds. Data gravity – where data is restricted in purpose-built silos with the focus on captive data services. Choice – hybrid data choices of services across clouds, flexibility and options. Which sounds like something I would prefer. Of course, Datera point out that “[d]ata is the foundation (and the hard part)”. What we really need is for a level of simplicity that can be applied to our infrastructure in much the same way as our applications are easy to use (except Word, that’s not easy to use). So what does this hybrid approach really look like? For Datera, there are a few different pieces to the puzzle. Predictive data analysis and insights. They reckon they can, and I tend to agree. They offer a bunch of features that feel like all kinds of hybrid. Online volume expansion, replica reconfiguration. Scale racks without overlay networking. Data services with compute affinity. 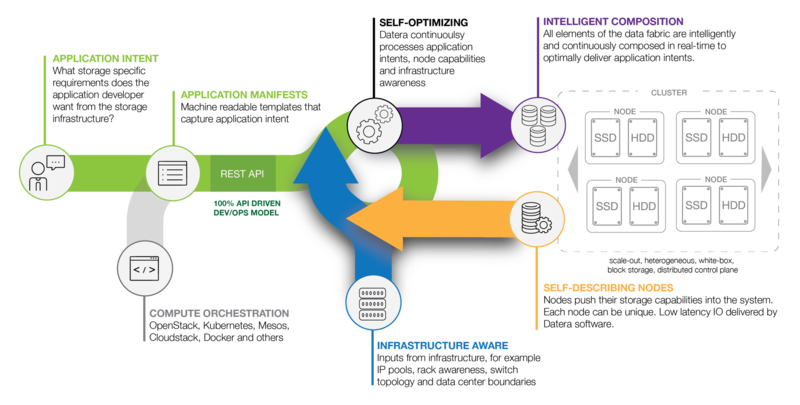 Dynamic run-time load balancing based on workload / system / infrastructure changes. IP pools, VLAN tagging for network isolation. Datera also get that you need good information to make good decisions around infrastructure, applications and data. To this end, they offer some quite useful features in terms of analytics and monitoring. From a system telemetry perspective, you get continuous system monitoring and a multi-cluster view. You also get insights into network performance and system / application performance. Coupled with capacity planning and trending information and system inventory information there’s a bunch of useful data available. The basic monitoring in terms of failure handling and alerting is also covered. It’s not just Datera that are talking about hybrid solutions. A bunch of companies across a range of technologies are talking about it. Not because it’s necessarily the best approach to infrastructure, but rather because it takes a bunch of the nice things we like about (modern) cloud operations and manages to apply them to the legacy enterprise infrastructure stack that a lot of us struggle with on a daily basis. People like cloud because it’s arguably a better way of working in a lot of cases. People are getting into the idea of renting service versus buying products outright. I don’t understand why this has developed this way in recent times, although I do understand there can be very good fiscal reasons for doing so. [I do remember being at an event last year where rent versus buy was discussed in broad terms. I will look into that further]. Datera understand this too, and they also understand that “legacy” infrastructure management can be a real pain for enterprises, and that the best answer, as it stands, is some kind of hybrid approach. Datera’s logo isn’t the only thing that’s changed in recent times, and they’ve come an awful long way since I first heard from them at Storage Field Day 10. I’m keen to see how their hybrid approach to infrastructure, data and applications develops in the next 6 – 12 months. At this stage, it seems they have a solid plan and are executing it. Arjan felt the same way, and you can read his article here. It’s the season for interesting announcements in the storage world. I don’t post about everything I get briefed on, but I do like to put up information on things I think are pretty cool. I first came across Datera at Storage Field Day 10. You can read my write-up on them here. I’m a fan of what they’re doing, and their platform is developing at quite a pace. So I was pleased to get a message from their CEO Marc Fleischmann wanting to tell me about a new integration they’ve developed for Google’s Kubernetes. Rather than go into it here, I thought it simpler to link to their press release and an article on the Datera blog. Isolate and protect them with dedicated storage segments. I think it’s worth checking out the excellent demo video which covers a lot of the capability. If you’re looking to add some scalable, persistent storage to your Kubernetes deployment, Datera might be just what you need. Disclaimer: I recently attended Storage Field Day 10. My flights, accommodation and other expenses were paid for by Tech Field Day. There is no requirement for me to blog about any of the content presented and I am not compensated in any way for my time at the event. Some materials presented were discussed under NDA and don’t form part of my blog posts, but could influence future discussions. Before I get started, you can find a link to my raw notes on Datera‘s presentation here. You can also see videos of their presentation here. Can be licensed as software-only as well with 2 SKUs available in 50TB or 100TB chunks. What Can I Do With a Datera? Infrastructure awareness – auto-forming, optimal allocation of infrastructure resources. What Do You Mean “Intent”? Pools of resources that will be consumed. I think this is a great approach, and really provides the infrastructure operator with a fantastic level of granularity when it comes to deploying their applications. Datera don’t use RAID, currently using 1->5 replication (synchronous) within the cluster to protect data. Snapshots are copy on write (at an application intent level). I know I’ve barely scratched the surface of some of the capabilities of the Datera platform. I am super enthusiastic about the concept of Application Intent, particularly as it relates to scale-out, software-defined storage platforms. I think we spend a lot of time talking about how fast product X can go, and why technology Y is the best at emitting long beeps or performing firmware downgrades. We tend to forget about why we’re buying product X or deploying technology Y. It’s to run the business, isn’t it? Whether it’s teaching children or saving lives or printing pamphlets, the “business” is the reason we need the applications, and thus the reason we need the infrastructure to power those applications. So it’s nice to see vendors such as Datera (and others) working hard to build application-awareness as a core capability of their architecture. When I spoke to Datera, they had four customers announced, with more than 10 “not announced”. They’re obviously keen to get traction, and as their product improves and more people get to know about them, I’ve no doubt that this number will increase dramatically. While I haven’t had stick-time with the product, and thus can’t talk to the performance or otherwise, I can certainly vouch for the validity of the approach from an architectural perspective. If you’re looking to read up on software-defined storage, I wouldn’t hesitate to recommend Enrico‘s recent post on the topic. Chris M. Evans also did a great write-up on Datera as part of his extensive series of SFD10 preview posts – you can check it out here. Finally, if you ever need to get my attention in presentations, the phrase “no more data migration orgies” seems to be a sure-fire way of getting me to listen.